Completely integrated kitchen set has every utensil for any gourmet backpacking trip. Lightweight tote keeps everything organized and nests within nFORM Crossover System Cooksets. Pivoting tools rotate from stored to working position. Waterproof shaker modules screw together to keep spices dry and flavorful. Completely integrated kitchen set has every utensil for any gourmet backpacking trip. Lightweight tote keeps everything organized and nests within nFORM Crossover System Cooksets. Pivoting tools rotate from stored to working position. Waterproof shaker modules screw together to keep spices dry and flavorful. 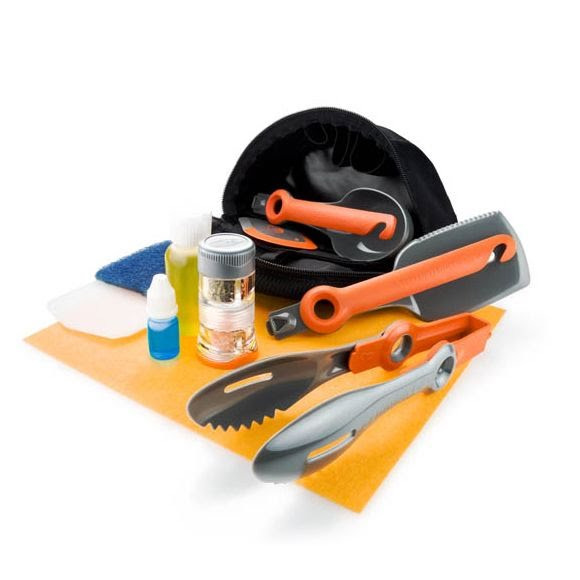 Camp towel, compact scrapper, dish soap dispener and scrubbing pad make cleaning quick and easy. Dimensions (packed) 7" x 3.5" x 4"